This is one heck of a sticky buns recipe. Anyone who takes the time to make sticky buns, thinks her/his are the best, but I have to admit these Pecan Honey Sticky Buns are fantastic. The sticky buns are made from buttery brioche dough, so right off the bat, you know it is special. The glaze is very sweet and very delicious. It's made of brown sugar, butter, honey and lots of pecans - when it is baked, the pecans turn into pralines. What's not to like? If you don't want 15 to eat now, you can make fewer and freeze the remaining dough. You'll just need to adjust the quantity of glaze in my sticky buns recipe. 1/2 recipe dough for Brioche Bread, chilled and ready to shape. Make the full recipe and cut the dough in half after refrigerating it overnight. Generously butter a 9x13 inch pan (a Pyrex is best). TO MAKE THE GLAZE: In a heavy bottomed saucepan, bring the brown sugar, butter and honey to a boil over medium-low heat, stirring frequently to dissolve the sugar. Pour the glaze into the buttered pan, evening it out as best you can be tilting the pan or spreading the glaze with a spatula. Sprinkle over the pecans. TO MAKE THE FILLING: Mix the sugars and cinnamon together in a bowl. Work the butter in another bowl until it is soft, smooth and spreadable. TO SHAPE THE BUNS: On a flour-dusted surface, roll the chilled dough into a 16 inch square. Using your fingers or a pastry brush, spread the softened butter over the dough. Sprinkle it with the cinnamon sugar, leaving a 1 inch strip bare on the side farthest from you. Starting with the side nearest you, roll the dough into a cylinder, keeping the roll as tight as you can. With a chef's knife, using a gently sawing motion, trim just a tiny bit from the ends of the roll if they are ragged or not filled well, then cut the log into 1 inch thick buns. Fit the buns, into the pan cut side down, leaving some space between them. Lightly cover the pan with a piece of wax paper and set the pan in a warm place until the buns have doubled in volume, approximately 1 hour and 45 minutes. The buns are properly risen when they are puffy, soft, doubled and touching one another. When the buns have almost fully risen, PREHEAT the oven to 375 degrees. Remove the sheet of wax paper and put the pan on a baking sheet lined with parchment paper. 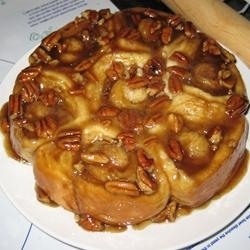 Bake the sticky buns for about 30 minutes, or until they are puffed and golden; the glaze will be bubbling. Remove from the oven. The sticky buns must be unmolded minutes after they come out of the oven. Use a baking sheet lined with buttered foil. Be careful - the glaze is super-hot and sticky. Keep this sticky buns recipe handy because you'll be using it often.